Today, parliament voted through a trade deal that threatens to lock us into the politics of austerity and high risk globalisation, whatever the cost and whoever comes to power in the future. The Comprehensive Economic and Trade Agreement (CETA) between Canada and the EU has been led by the government, and Labour’s manifesto proudly opposed it. Yet at the last moment, they backed down and abstained, leaving the deal to pass like a knife through butter despite opposition from Greens, SNP and Plaid Cymru. The deal was CETA, the free trade deal between the EU and Canada. It didn’t get much attention amidst roaring rows over Brexit and Heathrow, but if MPs want to have any chance of creating a society that works for all, then they need to bust the myths that this type of trade deal has anything to do with job creation and stop giving these deals the green light. 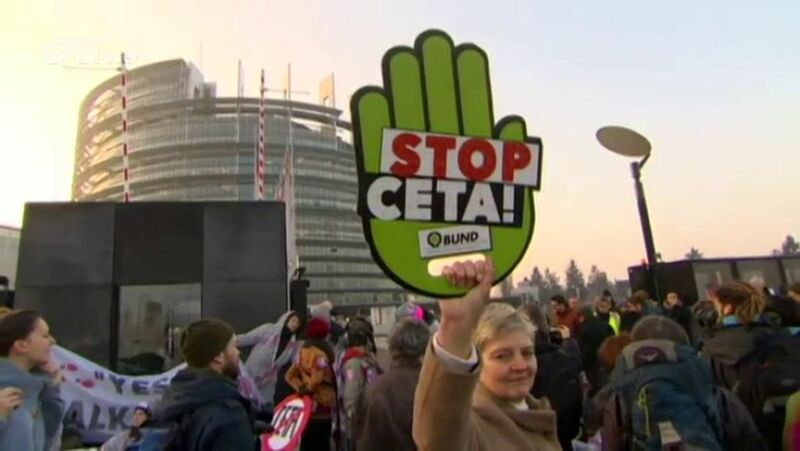 CETA comes from the same stable as the better known Transatlantic Trade and Investment Partnership (TTIP) – the controversial US-EU trade deal which was defeated thanks to action from millions of people across Europe who realised it could undermine our labour and environmental standards, not to mention public services. At their heart, both deals were designed to write corporate power into the rules of our societies. Governments come and go, but under these deals, unaccountable corporate power and the steady creep of privatisation would be held sacrosanct. Such deals are defended on the grounds they create jobs and growth. Yet the EU’s own Employment and Social Affairs committee judged that CETA is likely to lead to job losses and increasing inequality. CETA’s proponents have tried to present it as a gentler kind of trade deal. Anxieties over doing deals with America are one thing, but who’d have reservations about mild-mannered Canada? But opposition to TTIP was never about being anti-American. It was about not giving the world’s mightiest corporations a license to control our societies. And guess what? Many of those corporations have offices in Canada, too. Deals like CETA pose three fundamental threats. Firstly, they elevate privatisation from a policy to a law of nature. As well as selling off more public services, CETA would make it extremely difficult for any future government to return privatised services to public hands – even if the public elects a government to do just that. The deal pioneers a high risk way of negotiating services: unless specifically excluded, all public services are up for grabs. Even things we haven’t even thought of yet have already been given away, and it is inevitable that things will be overlooked and mistakes made. The approach becomes even riskier under a government that has little or no interest in protecting our public services. While other European countries negotiated fairly comprehensive exclusions to keep their health, education and social services out of CETA, the UK put in some provisions for private ambulances, care homes and private hospitals and left it at that. Everything else was to be abandoned to a corporate free for all, dominated by the dubious likes of Serco, G4S and Carillion. The second threat is deregulation. CETA aims to reduce what it calls trade ‘barriers’. What this actually refers to is the standards and regulations that we as a society, through our elected representatives, have chosen to put in place. There may be some things, like the exact colour of indictor lights or the thickness of tin cans, that no one is going to get passionate about. But when it comes to health, food safety, environmental protections and all the other areas that we value in life, those standards need to be determined by democratic processes, not by trade rules that judge everything solely according to whether it is the ‘least burdensome necessary’ for business. The deregulation is not limited to what is already written in the deal, because CETA also sets up a constellation of forums and committees to continue reviewing existing and proposed regulations. Corporate lobbyists will have input at every step of the way. Finally, CETA includes provision for the notorious corporate courts, although this part of the deal is suspended pending a judgement on its compatibility with European law. Corporate courts allow foreign companies to sue governments outside of the national legal system for any policy that might undermine their profits. Increasingly, corporations around the world use these courts to challenge everything from the minimum wage or plain packaging on cigarettes to bans on fracking, the phasing out of nuclear power and the requirement for corporations to clean up their own environmental disasters. The fines are huge, the legal costs are astronomical and even though corporations don’t always win, often the mere threat of prosecution forces governments to back down from introducing any legislation that puts our rights before corporate profits. Labour explicitly opposed these courts in their manifesto. As recently as last week, opposition leader Jeremy Corbyn spoke proudly about Labour’s position, calling these courts ‘dystopian’. Yet today the party decided to take a back seat and let the government entrench these courts. In essence, CETA clings to a debunked faith in deregulated markets and hyper-globalisation, hopelessly out of touch with economic reality. Across the world, this dogma has destroyed livelihoods, communities and the environment, while public anger has been exploited by demagogues. In the face of this, the solution is not to double down hoping that more of the same will finally lead to a different outcome. It can only deepen the damage. The solution is to build an approach to trade as shared prosperity. One where trade flows but strong collective rules and institutions ensure it supports people and planet, with corporations held to account for the impact they have on our lives. Today was a crushing disappointment, but we will not wait for Westminster to get on the right side of history. We will continue to work with our allies and millions of people across Europe to fight for an alternative based on trade justice and democracy. Still, the fact remains that thousands of constituents asked their MPs to take a stand today and instead, they sat down.